Only 16 Duelists remain! This Match features two World Championship Duelists! 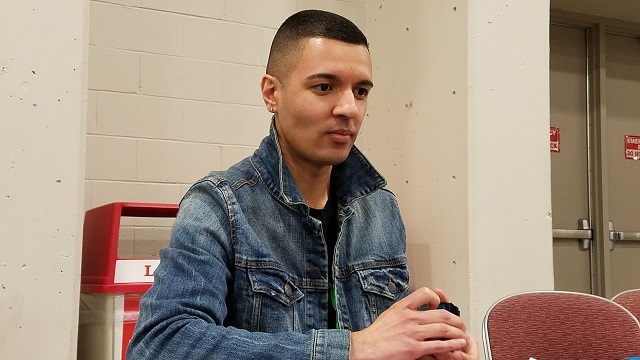 We’ve got Adrian Shakir, from Colorado Springs, CO, playing Mekk-Knight Invoked. His opponent is Vincent Paglia, from Las Vegas, NV, playing True Draco. It’s time to Duel! Paglia won the die roll and chose to play first. He started his Top 16 Match with Pot of Duality, taking Pot of Desires instead of Anti-Spell Fragrance or another Duality. He Normal Summoned Amano-Iwato, then played Pot of Desires. He activated Dragonic Diagram, destroying The Monarchs Stormforth from his hand to add Majesty Maiden, the True Dracocaster to his hand. He Set three cards in his back row and returned Amano-Iwato to his hand. Shakir had a hand of Effect Veiler, Ghost Ogre & Snow Rabbit, Mekk-Knight Blue Sky, Mekk-Knight Indigo Eclipse, Terraforming, and Pot of Desires. Paglia flipped up Anti-Spell Fragrance immediately. Shakir Set Desires in the same column as the Fragrance, and Special Summoned Indigo Eclipse. He used its effect to move it to the next zone, and Special Summoned Blue Sky to add Mekk-Knight Purple Nightfall to his hand. He Set Terraforming in his middle column, and Paglia flipped up the True Draco Apocalypse in that same column. He used Apocalypse to Tribute Summon Majesty Maiden, and Apocalypse destroyed Indigo Eclipse. Unfortunately for Paglia, Majesty Maiden was played in the same column as Terraforming, and Shakir Special Summoned Purple Eclipse. He activated its effect on itself, but Paglia flipped up The Monarchs Erupt! Shakir Normal Summoned Ghost Ogre & Snow Rabbit, Tuning it to Blue Sky for Scarlight Red Dragon Archfiend! It attacked Majesty Maiden, but the Maiden survived thanks to Dragonic Diagram. Paglia used Diagram to destroy his Upstart Goblin, getting True Draco Apocalypse. Majesty Maiden destroyed Purple Nightfall in battle, then Paglia Set one card to his back row. Shakir drew another Ghost Ogre. He flipped up Terraforming, and Paglia responded with Majesty Maiden. Shakir Chained to that with Ghost Ogre. 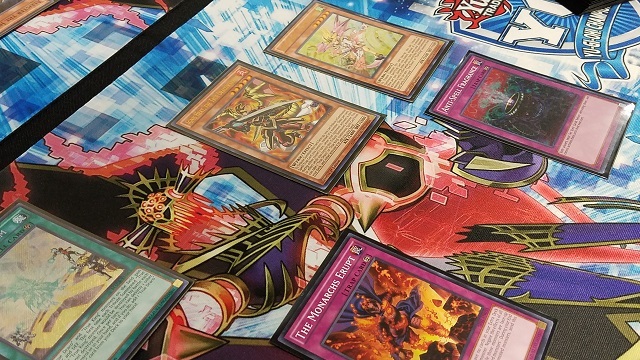 Majesty Maiden was destroyed, Paglia got Ignis Heat, the True Dracowarrior, and Shakir got Magical Meltdown. Paglia then flipped up Apocalypse and Tributed it to play Ignis Heat – Apocalypse destroyed Scarlight in the process. Shakir flipped up Pot of Desires, and Paglia used Ignis Heat to put Disciples of the True Dracophoenix in his hand. Desires resolved, and Shakir drew another Effect Veiler and Mind Control. He Set a Veiler, Meltdown, and Mind Control. Paglia’s Diagram destroyed Terraforming, and he got Majesty Maiden to his hand. He Set Disciples and Tributed it to play Majesty Maiden. Disciples destroyed the Set Mind Control. Majesty Maiden destroyed Shakir’s Veiler in battle, and Ignis Heat attacked directly. Shakir drew Solemn Strike, holding only that and Effect Veiler, with Meltdown Set. He flipped up Meltdown, and Paglia used Ignis Heat to get True Draco Heritage. Meltdown put Aleister the Invoker in Shakir’s hand. He started to Normal Summon Aleister and use its effect, but The Monarchs Erupt was still negating his monsters. He conceded, with no way around Paglia’s brutal The Monarchs Erupt and Anti-Spell Fragrance combination! Shakir chose to play second. Paglia started with Pot of Duality, taking Card of Demise. He played Disciples of the True Dracophoenix and Tributed it to play Majesty Maiden. He Set a Field Spell and a back row card, and activated Card of Demise – but Shakir had Ash Blossom & Joyous Spring to negate it. Majesty Maiden’s effect put Ignis Heat in Paglia’s hand. He flipped up Dragonic Diagram, then Tributed Majesty Maiden to play Ignis Heat. He activated Diagram’s effect, destroying his Set True Draco Apocalypse to get True Draco Heritage. He played Heritage and activated its effect, and Shakir destroyed it with Ghost Ogre & Snow Rabbit! Ignis Heat’s effect got another Disciples. He returned his Draco cards to the Deck to draw a card. He Set it in his back row. Shakir had Scapegoat, Terraforming, and Kumongous, the Sticky String Kaiju. He drew Unending Nightmare for the turn. He started with Kumongous, Tributing Ignis Heat to Special Summon the Kaiju to Paglia’s side of the field, in the same column as Disciples. He played Terraforming to get Magical Meltdown, that to get Aleister the Invoker, and finally played that to get Invocation. He activated it, but Paglia flipped Imperial Iron Wall! Shakir had to show his hand to prove he couldn’t perform the Fusion Summon. He Set Unending Nightmare and Scapegoat. Shakir immediately destroyed Diagram and Imperial Iron Wall with Unending Nightmare. Paglia Tributed Disciples to play Majesty Maiden, and Disciples targeted Shakir’s Set Scapegoat – Shakir Chained it to Special Summon four Sheep Tokens. Majesty Maiden’s effect put Master Peace, the True Dracoslaying King in Paglia’s hand. He sent Kumongous to destroy Aleister, and Majesty Maiden destroyed a Sheep Token. Shakir drew Ghost Ogre & Snow Rabbit. He used two Sheep Tokens to play Missus Radiant, then the last Sheep Token for Link Spider. He Normal Summoned Ghost Ogre and used all his monsters to play Borreload Dragon! Borreload attacked and took control of Kumongous, which then destroyed Majesty Maiden in battle. Paglia drew, now with just two cards in hand, one of which was Master Peace. He Set a card in his back row, and Kumongous was destroyed in the End Phase. Shakir drew Heavy Storm Duster. He Set it after attacking with Borreload. 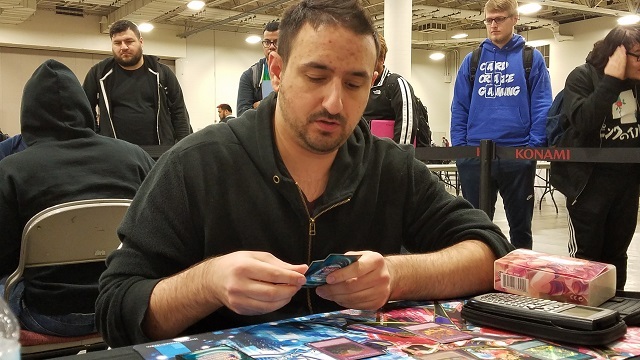 Paglia Set a second card in his back row, and Shakir flipped Heavy Storm Duster to destroy both of Paglia’s cards – True Draco Apocalypse and Disciples of the True Dracophoenix. The destroyed Draco cards activated in the Graveyard, and destroyed Borreload and Unending Nightmare. Shakir drew Mind Control and passed. Paglia played Diagram, destroying Master Peace to add True King’s Return to his hand. He Set it. Shakir drew Twin Twisters. He passed without Setting it, knowing Paglia had True King’s Return. Sure enough, Paglia flipped Return in the End Phase, and Shakir used Twin Twisters, discarding Mind Control, to destroy Return and Diagram. That left both players with no cards! Paglia played Amano-Iwato and attacked directly. Shakir drew Ash Blossom and passed. Amano-Iwato came down and attacked again. Paglia used Terraforming to get Diagram, and destroyed Amano-Iwato to get Disciples. He played it, putting Ignis Heat, Majesty Maiden, and True King’s Return back in the Deck to draw a card. He Set that card. Shakir drew Mekk-Knight Purple Nightfall and passed with no way to play it. Paglia used Disciples again, putting three more Draco cards in the Deck to draw again. He activated Diagram, and Shakir negated it with Ash Blossom. Paglia Set a card in his back row. Shakir drew Mekk-Knight Red Moon. He offered the handshake, knowing Paglia would get another monster with Diagram next turn. Vincent Paglia is moving on to the Top 8 with True Draco! Top 8 Feature Match: Ayinde Ross vs. Elvis Vu Winners of the 3 vs. 3 Team Tournament!